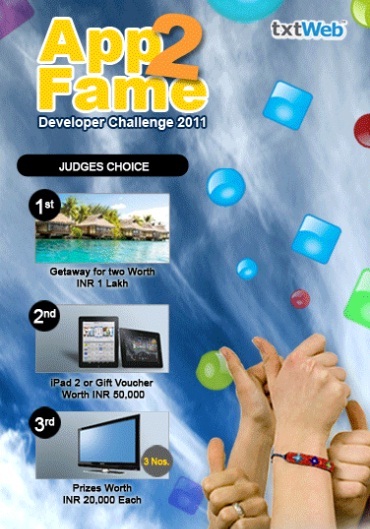 txtWeb, a platform where every mobile user can access information through SMS, recently announced the launch of the App2Fame Challenge 2011. This contest encourages developers in India to create apps for this SMS-based platform. txtWeb is looking for applications that are creative, innovative and with a potential to impact the lives of billions of mobile users. The developers of the best txtWeb apps stand to win exciting prizes under several categories including “Most Popular” and Judges Choice Award”. The grand prize winner under each of these categories will receive travel vouchers for Rs 1,00,000, and the second prize winner in each of these categories will win vouchers worth Rs 50,000 redeemable at an electronics store. In addition, three third prizes in each of these categories and the best apps in the sub categories of social networking, gaming and entertainment will win prizes worth Rs 20,000. The top five student developers will also be eligible for an internship with the sponsor or its affiliates and the top five startups will be given the opportunity to present their business plan to an expert panel. While the “Most Popular” apps will be determined by the number of unique users measured between July 1, 2011 and July 30, 2011, with 200 users as the minimum eligibility criteria, the finalists and winners for the “Judges Choice Awards” will be selected by a panel of 2-5 experts. Apps will be judged based on implementation quality and user experience.